Thanks for the giveaway, hope to win! Your Target site has enabled me to get my two boys real Christmas gifts this year! Thank you SO much!! Fantastic giveaway. Just in time for Christmas. Thanks for all the awesome giveaways! I hope I win! That gift card is Adorable! I love TT!! Happy Holidays! I just “liked” you on facebook and Im hoping all my friends and family do the same! Already “like” Totally Target on Facebook. I am already a TT facebook fan! i am already a facebook fan, too! Thank you so much for the chance to win – and for all you do!!! Adorable! Thanks for the great giveaway! I Like and Totally Love TT on Facebook! What a great giveaway! I love the little mouse my kids could drive our cat crazy and keep them ALL busy! You always find the fun stuff. Thanks for the chance to win. I LOVE Target. I already like TT on Facebook. Thanks for all the great posts. I love TT on FB! 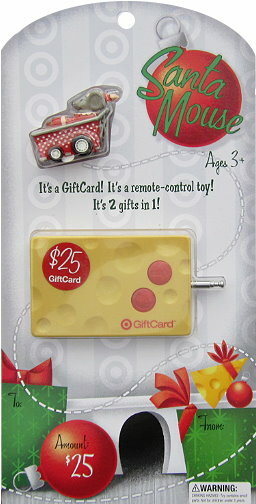 I sure wish I had found this GC in the store – my boys would love it!